-- Select a Size -- Small 10-13" Medium 13-18" - Out of Stock! Large 18-27" - Out of Stock! 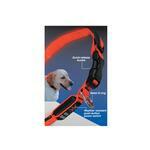 Keep your dog safe on night-time walks or bad weather with this Bright Orange LED dog collar! Flash or glow modes. Flexible, light-up polymer core surrounded by strong nylon webbing. Weather resistant - enclosed switch. Adjustable. Visible up to 1000 feet in the dark. Long life replaceable battery included. Nite Dawg LED Dog Collar - Orange Customer Photos - Send us your photo! Java loves her new collar. She can wait for the sun to set to turn it on and show it off! It matches perfectly with her Safety Orange Vest. Posted On 06/07/16 by Melissa C from , WI Yes, Melissa C recommends this product! Works great! And shines real bright. 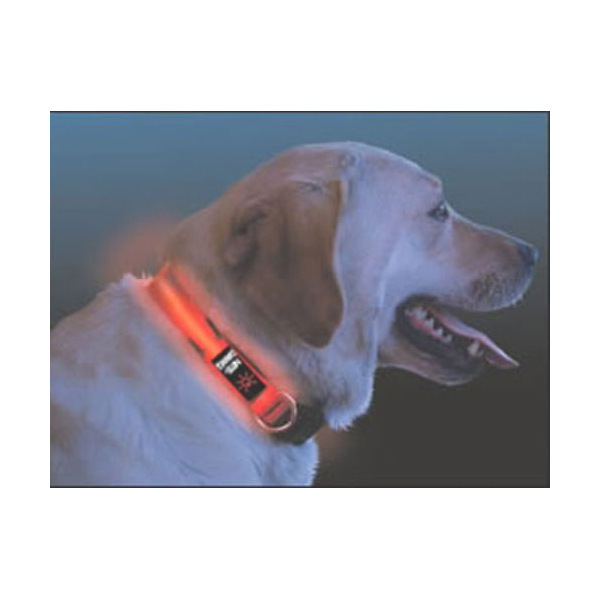 Has different settings for the collar to light up as. I love how bright the color is, just wish you could get it in different colors. Love this light up collar! Posted On 11/23/15 by Karen R from West Peterborough, NH Yes, Karen R recommends this product! I got this so we can go on walks later in the evening or just to put on my dog so I can see where she is when I let her out at night. Lights up PERFECTLY!! I bought large which I'm finding was a little bigger than I needed, but it's adjustable so I just have to measure and cut the inner light up stick to the right size. I am very happy with this product and the price can't be beat. You can't find any collar anywhere else that is cheaper. I looked around for a while for a light up collar but most of the collar out there only have a few lights on them, this whole collar lights up so it's exactly what I needed. Thanks again as always BaxterBoo for having the perfect item! Posted On 06/24/15 by Deborah M from Goodlettsville, TN Yes, Deborah M recommends this product! I really enjoy the collar because it makes it so easy to see our dog when we let him out to use the potty at night or if we are walking him at night, others can see him. Reasonable priced items, free delivery over $49.